There is a group room block for Food Microbiology Short Course participants at the Hampton Inn and Suites 1955 Waddle Rd., State College, PA. The group rate is $99 per night. To make reservations, please call the hotel directly at 814-231-1899 and mention you are with the Food Microbiology Short Course, code: FMC to secure the group rate.The cutoff date for the room block is April 20, 2019. The hotel is conveniently located near restaurants and shopping and just a short drive from the Penn State Campus and downtown State College. There is a group room block for the Food Microbiology Short Course participants at the Atherton Hotel located at 125 South Atherton Street, State College, PA. The group rate is $90.00 per night. To make reservations, please visit: https://www.choicehotels.com/reservations/groups/MT15Y4 to secure the group rate.The cutoff date for the room block is April 20, 2019. The hotel is conveniently located in downtown State College and is within walking distance to the Penn State campus. Parking for the course is available at the East Parking Deck, located on Bigler Road next to the Erickson Food Science Building. If you purchased a parking pass in your registration, you will pull a ticket upon entry and receive your prepaid pass at registration check in. You will need to scan the prepaid pass upon exiting the parking deck. American Eagle/USAirways, Delta, and United Express serve the State College area through the University Park Airport (SCE), located five miles from campus. Taxi service is available for all flights by calling 814-353-6001. The Holiday Inn Express provides complimentary shuttle service for hotel guests. Please contact the hotel at 814-867-1800 to arrange for an airport pick-up. Please call to reserve vehicles before you arrive. Located ninety miles southeast of State College, Harrisburg International Airport offers an alternative arrival and departure location. Airlines serving Harrisburg include Air Canada, American Eagle, Continental, Delta, Northwest, United, and US Airways. Rental car service is available. 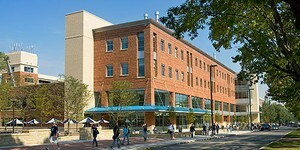 There is a bus station located very close to the Penn State campus, 152 N. Atherton St, State College, PA. Phone (814) 238-7971. The station is serviced by Greyhound Bus Lines; visit http://www.greyhound.com or call 1-800-231-2222 for ticket information. The Campus is located within driving distance of many major cities including Harrisburg (1.5 hrs., 90 mi), Pittsburgh (3 hrs., 137 mi), Philadelphia (3.5 hrs., 194 mi), Baltimore (3.5 hrs., 155 mi), Washington D.C. (4 hrs., 190 mi), New York City (5 hrs., 250 mi) and Toronto (6.5 hrs., 304 mi). From New York City, the suggested route is via the George Washington Bridge to I-80. In Pennsylvania, exit I- 80 at exit 161 (Bellefonte) and follow PA Route 220 south to State College. Take exit 74 for Innovation Park/Penn State University. From the Philadelphia area, take Philadelphia Schuylkill Expressway to the Pennsylvania Turnpike, leave the Turnpike at exit 247 (Harrisburg East), and follow I-283 to I-83 and proceed north on I-83 to the I-81 interchange. Then follow I-81 south to Route 322, 22 West exit. Proceed west on Route 322 through Lewistown to State College exit #74. Follow Route 22 East beyond Duncansville to Water Street, Route 45 East to Pine Grove Mills and Route 26 North to State College. From the west, take I-80 to exit 123 (Woodland) just east of Clearfield, then US Route 322 east to State College, or exit I-80 at exit 161 (Bellefonte) and follow PA Route 220 south to State College. take I-95 or the Baltimore-Washington Parkway to Baltimore, west loop I-695 to I-83 north. Continue on I- 83 north to the I-81 interchange. Then follow I-81 south to Route 322, 22 exit. Proceed west on Route 322 to Lewistown and State College.